Bajaj Allianz is one of the top players in the life insurance industry in India. The privately-held firm offers a diverse range of life insurance covers for its customers. The plans offered by Bajaj Allianz includes term plans, endowment plans, ULIPs, retirement plans, child plans, etc. If you are looking for a life insurance policy, you may explore the policies offered by Bajaj Allianz and understand the features of the cover. Being one of the top players in the market, the company has extensive presence all over the country. Here is a detailed look at various attributes of the company. Why should you go for Bajaj Allianz Life Insurance Company? Bajaj Life Insurance offers customers life insurance solutions that are competitively priced, with transparent benefits and the latest technology support. Their range of products cater to varied segments and age/income profiles. They offer life insurance solutions to address various financial needs such as protection, savings, investment for individuals and groups, and retirement. The suite of products also includes plans that assist the customer in saving tax, while availing protection, savings, and investment benefits. The company was awarded the “Best Digital Customer Experience Initiative” for Life Assist Customer Portal at the Customer Loyalty & Experience Awards 2018 at the 11th edition of The Customer FEST Show. We were awarded the SKOCH Order of Merit for Micro Insurance Segment Leadership, Digital Claim Settlement Process and Digital Initiatives for Customer Services. Bajaj Allianz Life Insurance has been conferred with the prestigious “2016-17 Vision Awards for Annual Report Competition” by the League of American Communications Professionals (LACP). We were ranked amongst the Top 100 Annual Reports worldwide for the fiscal year 2016-17 and also received the Gold Award for excellence in the industry for annual report development. This award represents the company’s excellent contributions in the insurance field. Bajaj Allianz Life Insurance was recognized in the Micro Insurance category for its leadership in the segment. Bajaj Allianz Life Insurance won ‘Private Sector – Life Insurance Claims Service Leader of the Year’. This is the purest and most economical form of life insurance. The insurance coverage is provided for a specific duration, i.e., for 30 years or up to 75 years of age. While the policy is in force, the insured pays a fixed premium at predefined intervals. If the life assured dies during the policy term, the insurer pays the death benefit to the nominee. This is referred to as the sum assured. In the event of accidental total permanent disability, the remaining premiums under the plan are waived off and the other insurance benefits continue. In the event of accidental total permanent disability (ATPD), the sum assured is paid as ATPD benefit. The remaining premiums under the plan are waived off and the other insurance benefits continue. Death benefit equal to the sum assured, if the death was not due to an accident. In the case of death of the life assured in an accident, the sum assured on death and an additional amount equal to the sum assured is paid as ADB. Accelerated Critical Illness (ACI) benefit is paid if the life assured is diagnosed with certain critical illnesses. Death benefit equal to the sum assured, if the ACI benefit was not paid earlier. If the ACI was already paid, then the sum assured at death minus the paid ACI benefit is payable. This policy provides a level term insurance cover at low premiums, with a large sum assured. The plan enables the customer to select the policy term and premium payment frequency. The death benefit can be taken in equal monthly installments by the nominee. The plan provides tax benefits on premiums paid. Customers who maintain a healthy lifestyle will be rewarded with special premium rates. The plan provides an incremental cover of 5% per annum at the end of each year. Depending on the policy term, you can increase your insurance cover upto two times the sum assured. High sum assured rebate is offered for policies with sum assured above Rs.5 lakh. Customers can choose a policy term, based on their insurance needs. The policy offers tax benefits. There is an option for disbursement of policy proceeds in the form of monthly installments. iSecure Loan The plan protects you and your family from loan liabilities. Some of the loans covered are home loan, auto loan, personal loan, and credit card dues. The plan offers life insurance up to 100 years of age, and has attractive rates for female customers. The plan provides a regular income for the family, as plan benefits are paid out in monthly installments. The coverage includes an Accelerated Terminal Illness (TI) risk cover. Medical examinations are not required to avail the policy. The plan has attractive rates for female customers. A ULIP provides the customer life insurance coverage and market-linked benefits under a single policy. It is also possible to partially withdraw or surrender ULIPs. The plan offers the customer the choice of two investment strategies, with a choice of 7 funds. Customers have the option to pay a top-up premium. It is possible to decrease the sum assured and alter the premium payment frequency as well. Customers can also avail the maturity benefits in installments, if required. The policy provides Loyalty Additions of 3% of the single premium, depending upon the term and premium chosen. Customers can choose to invest in any of the 7 funds, based on their risk appetite. The option to pay a top-up premium is available. Customers can choose to decrease the sum assured or switch between funds to manage the investments. The plan also provides the option to avail the maturity benefit in the form of instalments. The plan provides the customer the benefits of life cover, principal protection, and high returns. Guaranteed Loyalty Additions are provided at policy maturity. Customers can choose from various options for policy terms and premium payment terms. The maturity benefits can also be availed in installments, if needed. A plan in which a customer contributes a regular amount of money for the purpose of reaching his/her short-term or long-term financial goal, while being protected by life insurance, is a savings plan. This is an endowment policy that provides you a guaranteed maturity/death benefit of 115% of the sum assured. You can choose from 2 policy terms and premium payment terms. Customers can take the policy benefit in monthly installments, if required. High sum assured rebate on premium is offered. Riders can be used to enhance the base policy. The customer has the choice of 3 policy terms, while the premium payment term remains fixed. Guaranteed Additions are provided up to 63% of the sum assured on maturity. High sum assured rebate is provided. The company offers attractive premium rates for female customers. The customer has the option to take the policy benefit in monthly installments. The policy provides Guaranteed Money Back of up to 150% of the sum assured at regular intervals. Customers can choose from 4 policy terms. The premium payment term is shorter. High sum assured rebate is offered. Special rates are available for female customers. The plan helps in meeting key financial milestones of the customer through the option of multiple policy terms. The plan offers two variants, i.e., Super and Life. Customers can choose to avail the death benefit in the form of a monthly income. Bonuses are offered every year, and the insurer offers special rates for female customers. The policy can be enhanced through riders. The policy provides a guaranteed monthly income to customers. The plan comes in two variants, i.e., Assure and Income. Customers can choose 4 policy terms and riders, based on their needs. The plan also offers bonuses to enhance savings. Special rates are provided for female customers. An investment plan offers life insurance coverage and investment benefits under a single policy. The plan offers the customer the option to choose 1.25 times or 2 times the sum assured as life coverage. Compound reversionary bonuses and terminal bonuses are provided. There is a limited premium payment term. The plan enables policyholders take the benefits in the form of monthly installments. High sum assured rebate is given. Customers can enhance the plan through riders. Special rates are given to female customers. The plan provides the dual benefits of life insurance cover and returns from investment. Guaranteed Loyalty Additions up to 315% of the Guaranteed Maturity Benefit are provided. The base policy can be enhanced through riders as well. A retirement plan is a systematic investment and savings option that helps you organise your finances, so that you accumulate a significant amount in your retirement corpus. The plan offers a regular income post retirement. The plan offers guaranteed vesting benefit and guaranteed death benefit. Customers have an option of choosing regular, single, or limited premium payment. Customers can also change the premium payment term. Policyholders get the flexibility to pay a top-up premium, if needed. Child plans offer the insured a lump-sum payout at the death of the policyholder. The future premiums are also waived off, and the paid premiums continue to be invested on behalf of the policyholder. Hence, the plan provides security against inflation and the rising cost of education in the face of an adversity. The plan offers flexible policy terms and premium payment terms. Guaranteed Additions, Guaranteed Maturity Benefit, and bonuses are provided. The plan provides comprehensive coverage at death or accidental disability. The coverage can be enhanced through optional riders. The plan is available at special rates for female customers. Cash bonuses are provided from the end of the 6th year. Life insurance coverage is offered up to the age of 100 years. Based on the premium payment term, you can get a Guaranteed Death Benefit of up to 300% of the sum assured. The policy benefits can be availed in the form of monthly installments. Customers can choose from 3 premium payment terms. Attractive rates are offered for female customers. The base plan can be enhanced through riders. Based on the age of the child, policy terms can be fixed to provide an uninterrupted flow of income to the child for his/her education purposes. The plan has an in-built accidental permanent total disability cover. The plan includes a waiver of premium cover that comes into action in the event of untimely demise of the parents. The plan helps you save on a regular basis, so that you can meet the career aspirations of your child. Bajaj Allianz provides customised group insurance policies that safeguard the interests of employees and their families. If you are a company that undertakes land from small landowners or farmers for construction purposes, you can benefit from this plan. This plan provides you a way in which you can gift the land owners/members and their families a regular income in the form of an annuity. A death benefit is also provided in the event of death of the landowner. The plan provides death benefits, maturity benefits, and surrender benefits to the insured members. Additional rider benefit is also offered. Employers can make use of this plan to manage employee benefits such as gratuity and leave encashment. The plan helps in building a fund to ensure the discharge of your liabilities as an employer, in a convenient manner. The plan can be taken by employers to offer benefits to employees, as part of the statutory requirements. Group Employee Benefit plan assists employers in meeting obligations towards employees by helping them set and manage funds for leave encashment and gratuity benefits. Group Term Care This is a non-linked, non-participating single premium group term insurance plan that offers you a proportionate return of premium at the time of maturity. This is a non-linked, non-participating, variable fund-based scheme that can be taken by an employer to manage the pension fund of the employees. The scheme helps in building a retirement fund so that the employee receives a regular flow of income after retirement. The plan offers a minimum Guaranteed Interest Rate and an Additional Interest Rate. The plan can be bought by employers for the welfare of the employees. The scheme provides assured regular income/pension to members after their retirement. Group Credit Protection Plus The plan offers an economical method of protecting your family members from the burden of loan repayment in the event of your demise, critical illness, or accidental permanent total disability. This is a traditional, non-linked, non-participating group savings plan. It offers a Guaranteed Interest Rate and an Additional Interest Rate that is also guaranteed. This is a non-linked, non-participating, single/regular premium group term insurance plan that is available on Single Life basis only. The plan provides death benefits, maturity benefits, and surrender benefits. The benefits are paid to the policyholder and these are then passed down to the beneficiary. This is a non-linked, non-participating, renewable group term insurance plan. Enrolment is through a simple proposal form, and no medical underwriting is required. The plan offers life coverage based on the affordability of the customer. A bank that has account holders between the age of 18 and 50 years can enrol in the plan. Account holders will be the members, while the bank is the master policyholder. The insurer sells this product only through CSC. The insurance policy provides maturity benefits and death benefits to the customer. Guaranteed Interest Rate (GIR) and Guaranteed Additional Interest Rate (AIR) are offered. The customer can opt for partial withdrawals and also alter the premium payment frequency, if required. A micro insurance product is specifically designed to protect people in the low-income bracket against the risks in life. The micro insurance products offered by Bajaj Allianz cover the impending liability of customers and provide them an opportunity to save in an organised manner. The plan provides life insurance cover for affordable premiums. There is a guaranteed payout at maturity or death of the life insured. The plan returns 100% of the paid premiums at maturity. The customer can choose from 3 policy terms, i.e., 5, 7 or 10 years. There is an option to avail a loan against the policy. This is a low-cost life insurance plan that also offers savings to the customer. The enrolment process is easy and simple. The plan provides Guaranteed Investment Returns. Customers can choose to partially withdraw from the policy in the event of financial emergencies. How to Make a Claim with Bajaj Allianz? Once the claim is registered, the claimant will be provided another set of claim documents that are required for the claim processing. A dedicated team will follow up with the claimant. Once they receive all the required documents, they will perform the assessments. Following this, the claim will be settled for payments. The decision on the claim will be communicated to the claimant by SMS and a detailed letter. If the claimant is not satisfied with the decision, he/she can approach the Claims Review Committee for the claim review. The Claims Review Committee at Bajaj Allianz is headed by a retired civil judge, and it focuses on unbiased reviews of each claim. In order to file a death claim, the nominee visits a branch of Bajaj Allianz with all the mandatory documents. Once the documents are submitted, the claim will be initiated in the Bajaj Allianz Life Insurance system by a branch assistant. Claim forms that are barcoded will be generated, and these need to be filled by the nominee/assignee/appointee. When all the documents are submitted, the claim will proceed towards further processing. The nominee can visit the ‘Claim Status’ section to see the status of his/her claim. The insurer can also be contacted at 1800 209 7272 for clarifications on queries. ID Proof - This can be your passport, PAN Card, Voter’s ID, etc. Age Proof - Your Passport or Voter’s ID can be used for this purpose. Income Proof - You can submit the recent payslips from your current employment. Address Proof - You may submit your passport or utility bills for this purpose. PAN Number - This will be available in your PAN Card. How to Check the Policy Status? Once the policyholder logs in to the Bajaj Allianz website, he/she can check the status of the policy through the corresponding menu option. Customers can also send an email to the customer care centre of Bajaj Allianz, quoting their name, policy number, address, and mobile number. The status of the policy will be notified to the customer through an email. The email ID of the insurer is customercare@bajajallianz.co.in. Policyholders can use the option of live chat on the website to get in touch with a customer service representative. He/she will be able to provide an update on the policy status. Customers can walk into Bajaj Allianz Life Insurance office branches and enquire on the status of their policies. Alternatively, they can call the insurer’s toll-free number 1800 209 7272, for clarifications. There is an SMS facility using which policyholders can enquire about the status of their policy. Credit Card - Customers can pay the premium using their Visa, Maestro, MasterCard, Amex, or Diners Club cards. Debit Card - It is possible to pay the premium online using Visa, Maestro, MasterCard, or Rupay cards. Netbanking - Customers can also choose to pay their premiums through the Net Banking facility offered by their banks. e-Wallets - Bajaj Allianz life insurance premiums can be paid using e-Wallets, like Airtel Money, JioMoney, etc. as well. Bill Junction - It is also possible to pay insurance premiums online through Bill Junction. Customers will have to register at the Bill Junction website and follow the instructions there. Bajaj Allianz offers customers the facility to calculate their life insurance premiums using the premium calculator facility, Balc CareQuote at their website. The tool provides the customer the premium quotation and a benefit illustration. A customer is required to select the plan he/she wishes to buy and provide certain details such as, personal info, level of coverage required, riders to be included in the plan, mode of premium payment, etc. The tool will calculate the premium and inform the customer of the same. Q. What is a benefit illustration that you get from the Bajaj Allianz website? A. In the context of life insurance, a benefit illustration is a projection of the cash flows and benefits associated with a life insurance policy. The life insurance premium calculator on the Bajaj Allianz Life Insurance website provides the benefit illustration when a customer requests for a quote. Q. What will happen to the Bajaj Allianz life insurance coverage when the customer starts drinking or smoking after taking the policy? A. There will be no effect on the base insurance policy. If the policyholder suffers accidental injuries under the influence of alcohol, and suffers death or disability, it will not be covered under the insurance. Q. 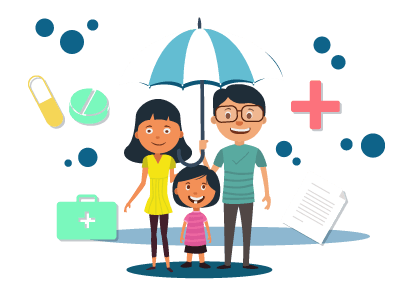 What are the different ways in which I can pay for my Bajaj Allianz life insurance? A. Based on the Bajaj Allianz product you have chosen, you will be required to pay for the insurance either through a ‘single premium’ or a ‘regular premium’. In the case of a ‘regular premium’ policy, you can pay premiums annually, semi-annually, quarterly, or monthly. Q. What are the riders provided by Bajaj Allianz Life Insurance? Waiver of Premium Benefit Rider - In the event of untimely death or critical illness of the policyholder, this rider provides a waiver of all future premiums that should be paid under the policy. The insurer also provides a ULIP Waiver of Premium Benefit Rider that is specifically applicable to ULIPs. Accidental Death Benefit Rider - The rider provides an additional rider sum assured if the policyholder suffers untimely death in an accident. The insurer also provides ULIP Accidental Death Benefit Rider and Group Accidental Death Benefit Rider that are specifically applicable to ULIPs and group plans, respectively. Accidental Permanent Total/Partial Disability Rider - The rider provides an additional sum assured in the event of permanent disability from an accident. The insurer also provides ULIP Accidental Permanent Total/Partial Disability Benefit Rider and Group Accidental Permanent Total/Partial Disability Benefit Rider that are specifically applicable to ULIPs and group plans, respectively. Critical Illness Benefit Rider - This rider provides an additional sum assured if the policyholder is diagnosed with any of the 11 critical illnesses specified in the policy. The insurer also provides ULIP Critical Illness Benefit Rider and Group Accelerated Critical Illness Rider that are specifically applicable to ULIPs and group plans, respectively. Family Income Benefit Rider - The rider provides a benefit of 1% of the rider sum assured that will be paid on a monthly basis. This is subject to the policyholder suffering the first occurrence of accidental disability, death, or diagnosis of any of the 11 critical illnesses mentioned in the policy. The insurer also provides a ULIP Family Income Benefit Rider that is specifically applicable to ULIPs. Hospital Cash Benefit Rider - The rider provides the policyholder Hospital Cash coverage that includes a daily hospital cash allowance of Rs.4 per Rs.1000 sum assured, subject to certain limits. Q. For how long should a Bajaj Allianz life insurance policy be in-force before it can be surrendered? A. It is possible to surrender a policy only after the lock-in period is completed. This could be 3 or 5 years, depending on the specific plan. Q. What are the documents that should be submitted for policy surrender? Q.What are the timelines that the insurer observes for policy surrender to take effect? A. After the customer submits a policy surrender request, he/she gets a confirmation call for the payment. If the customer prefers the payment to be done through a cheque, the process will take 8-10 days. If he/she chooses direct credit payout, the process takes 7-8 days. Q. My claim has been rejected by Bajaj Allianz Life Insurance. What could be the reasons for the rejection? The policy was in lapsed status when the claim was raised. The policy does not cover the event for which the claim was raised. The loss that was reported in the claim does not qualify as a loss, either marginally or totally. It is advisable that you check the exclusions under your policy document, and be aware of the coverage before you raise claims. Q. When I first took my Bajaj Allianz life insurance policy, I had mentioned an address that has changed since. How can I communicate the new address to the insurance company? A. You can visit the branch of the insurance company and inform the policy servicing department of the address change. You can also log on to the customer service portal of Bajaj Allianz and change the address online. Q. How many times in a year can I avail the benefits of the CI and HCB riders I have opted for? What is the upper limit for each rider? A. If the Critical Illness (CI) rider is triggered, the payout is made in full, and the rider then ceases to exist. A total of 60 days can be claimed under Hospital Cash Benefit (HCB) rider in a policy year. The Insurance Regulatory and Development Authority of India (IRDAI) has proposed certain changes in insurance linked and insurance non-linked products in a draft guideline. The proposed changes came in last month and the insurance industry is positive about the suggested changes. The industry experts say that the changes will make the products more customer-friendly and give it more flexibility for insurance companies to offer better products. One of the proposed changes is to make the minimum death benefit of life insurance policies 7 times the regular premium and 1.25 times the single premium for all age groups of life assured. Currently, the limit for the death benefit when the life assured is less than 45 years is 10 times. The suggestion is to make the limit the same across all age bars. Apart from the death benefit, IRDAI has proposed to minimise the 5-year old guideline to 2 years for the non-linked policies to acquire a surrender value. Also, the extension of the revival period from 2 years to 5 years has been proposed. Further, the regulator has said that the customer should be given the option for commutation of the pension product up to 60%. Further, it was suggested that options be given for the settlement option period to extend it to 10 years or continue it up to the policy term, whichever is the shorter duration. E-commerce company Flipkart has entered the insurance business after IRDAI approved them of selling insurance products and gave the company the corporate licence. Flipkart has teamed up with Bajaj Allianz and will provide coverage for the mobile phones it will sell through its portal. Flipkart’s big billion day which commences on 10th October 2018 will see the e-commerce company offer its customers purchasing mobile phones the option to insure the product. The customers can benefit by getting a free service or reimbursement in case they lose or damage their mobile phone. The plans will be priced at Rs.99 per year. The claim process will be directly facilitated through the Flipkart mobile app or the official website. The Department of Posts recently launched a Payments Bank by the name India Post Payments Bank (IPPB). The bank has now entered into a partnership with Bajaj Allianz Life Insurance to distribute their life insurance products. While this partnership will help IPPB inch closer to its goal to create awareness and increase financial inclusion in the country, Bajaj Allianz will benefit from the wide network of post-offices in the country where their products will be sold. The product being offered is a simple life insurance plan with accidental death benefit and will be easy to understand. Post-men and post-assistants will sell the life insurance plan and they will use a mobile phone to carry out the transactions. Since the products are technology based, no paperwork is involved. IPPB has 3,250 access points, 11,000 doorstep service providers, and 1.55 lakh points of service. Once the 1.55 lakh points of service are linked, 3 lakh people will be able to sell the life insurance plans. The Chief Executive of the government-backed payments bank said that since banks are not allowed to sell insurance, they had to tie-up with an insurer. IPPB will distribute the life insurance products and will receive a commission in return. One of the top players in life insurance sector in the country, Bajaj Allianz is looking to widen its reach into the health insurance sector with the Bajaj Allianz Life Health Care Goal policy. With a single premium payment for the Bajaj Allianz Life Health Care Goal, policyholders can insurer their family up to 6 members. Commenting on the policy, CEO Tarun Chugh, said that the Bajaj Allianz Life Health Care Goal policy is unique as it offers the sum assured as soon as the person or the policyholder is diagnosed with the illness unlike other insurers that offer the sum assured after the treatment of the illness or following the death of the policyholder. According to the Managing Director and the CEO of Bajaj Allianz Life, he added by saying that the policyholder has the benefit of the return of premium option if no cover has been availed during the tenure of the policy. The Bajaj Allianz Life Health Care Goal policy comes with two variants that policyholders can opt for based on their requirements. Bajaj Allianz Life Insurance Company has announced a growth of 47% in its new business premium collection in Q1 of FY19 in Karnataka. The insurer issued a total of 2,097 policies in the region, thus registering a 47% growth. In comparison, the the insurance provider had issued 1,425 policies in the state during the corresponding period in the previous financial year. Also, in an effort to cater to the needs of its customers and to ensure that all customers are able to meet their life goals through insurance solutions offered by Bajaj Allianz, the insurer has launched the Bajaj Allianz Life Goal Based Savings Plan and the Bajaj Allianz Life Goal Assure Plan. Initial insurance claims related to the recent Kerala floods may amount to the tune of Rs.500 crore according to an executive from a public sector insurance company. Kerala is currently battling the worst natural calamity it has faced in the last century. It has also suffered damages in life and property to the tune of thousands of crores. According to an executive from New India Assurance, claim intimations are already coming in from various policyholders across the state. As of now, the company is getting claim intimations related to property damages from people who are in other locations. Once people from the relief camps go back to their homes, it is likely that the claims are going to increase further. It is expected that most of the claims will be related to life and motor insurance. Initial claims regarding these losses are expected to touch Rs.500 crore. In addition to damages caused to life and property, the state has also witnessed a huge loss in income due to the crippled tourism and service industry. I have been previously used the life insurance policy with the BAJAJ ALLIANZ LIFE INSURANCE where i have used it for 3 years and the premium i pay by 6 months once basis with this insurance policy but i am not satisfied because the reason is that the sum assured is lower than the premium so i have closed the policy. I am not satisfied with the life insurance policy where i have taken it from the BAJAJ ALLIANZ LIFE INSURANCE because the customer service is not good also i have not got the hard copy. The premium i am paying on yearly once with this policy also the maturity period of this policy is for 10 years. BAJAJ ALLIANZ LIFE INSURANCE is the life insurance policy where i have purchased the TERM PLAN with this policy. I have been using it since from last 3 years and the premium am paying on yearly basis for this insurance policy, the coverage is for self. I have closed the policy with LIC policy. I have closed the policy in 6 years. I have taken the policy in the year of 2010. I pay the premium amount of Rs. 30000 and total tenure period of 12 years. LIC service is good and they need to improve the customer care services. "Customer service needs to be improved"
I compared different plans with Bajaj Allianz life insurance, it has good ranking and the claim settlement ratio is good. But those guys are very delay in process activation and also I have to pay the premium twice in one month they taken long time to clear my issue. I took insurance policy comes ULIP for 15 years, the plan is based on my expectation. I took my ULIP policy in the year of 2009 with a Bajaj Allianz. My friend has referred me to take this policy. I pay the premium amount of Rs. 12000 per annum. I have already cancelled this policy because the policy maturity is based on the market and i may get a loss of money. The sum assured amount also very less. They are not providing good return after the maturity, earlier I made the premium around Rs. 35k, for two policies, one is for 7 years and another 5 years, both polices has tax benefits and financial security . But I suggest them to improve on the IVR system its always unable to connect with them. I purchased a life insurance policy with Bajaj Allianz. The policy got matured however i have not get any benefits from the company. I just chosen the ULIP policy for 5 years. Total tenure period of the policy is 5 years. Since the market value is went down, i have got the lower amount. The policy is totally depends on the market only. I used to make the payment through online. I was canceled my Bajaj allianz life policy because they have not fulfilled the commitment, I have paid the premium nearly for 4 years for Rs. 50000 in money back policy. But I am not satisfactory with their service and policy cover and they are not willing to give the call back to the existing customer. I had been using the life insurance policy with BAJAJ ALLIANZ GENERAL INSURANCE since last 10 years. Premium i am paying for 6 months once and the maturity period for this policy is for 15 years. I am not aware of the premium but it is nominal. I'm holding the life insurance policy with Bajaj Allianz. My agent has recommended me to take the policy. The company is fraud. This is a one time payment risk covered policy. I have made a premium amount of Rs. 10000. This is 7 years tenure period. When i closed the policy, they have given me only Rs. 2000 and they are saying that they have charged some charges for maintaining the policies. I have taken my united linked insurance policy (ULIP) with Bajaj Allianz. This policy is an excellent policy. The payment mode has been changed to digital. I have bought this life insurance policy 2 years before. This is a life covered policy. I have been paying the premium of Rs. 40000 every year. I will get a sum assured amount of Rs. 4 lakhs. Total tenure period is 20 years out of that paying term will be 5 years and lockin period is 5 years. I can go for a loan from the 2nd year. I have to make the payment of Rs. 11000. I chosen the yearly payment mode. My money back was taken from Bajaj Allianz. I used to make the payment through online. In customer care, they used to given proper explanation about the policies. I will get the returns every 4 years. Totally its 15 years tenure policy which is having a 3 years lockin period. One of my friend who is working in Bajaj Allianz has referred the life insurance policy. This is a term insurance policy which i taken for my home loan. I have not received the insurance documents. The premium amount has also not deducted from my account. The features of the policy is fine. Since for nearly few years that i have been using my life insurance with the BAJAJ ALLIANZ LIFE INSURANCE and there is no proper service and they reduced money from my insurance and fore 1.5lakhs they have reduced like 35k as a commission so i have closed this policy. As i am holding my life insurance from the BAJAJ ALLIANZ LIFE INSURANCE and the documentation that i have done it through the on line and i have been using it through the 1 year and the tenuity period i have no idea and the premium i pay annually. The life insurance and i am using since 5 years and the documentation done through the on line. Tenuity period is for the 5-7 years and the premium i pay for the 5 years the sum i get in 7th year. The premium is for 3 months once that i pay through the on line. They are providing the sum assured amount of Rs. 1.20 lakhs. I have chose this Super saver policy nearly 8 years ago. I'm paying the premium of Rs. 11.800. Its a life covered policy. Tax saver policy apart from this there is no other benefits. I'm paying the premium one year once. I will do the payment through credit card. BAJAJ ALLIANZ LIFE INSURANCE from where i have been using it as a life insurance from last 1 year and documentation done on line. The tenuity period is for the 23-25 years the coverage is for self and premium i pay for 4k per month through the on line. The sum amount i get 1cr.